A guide to the relent building block puzzle game, tetris. There are seven different shapes, or “Tetriminos” in Tetris: the S, Z, I, L, J, T and O-Tetriminos, which look like the letters they are named after. The key essentials to most Tetris variants are your score and your level. 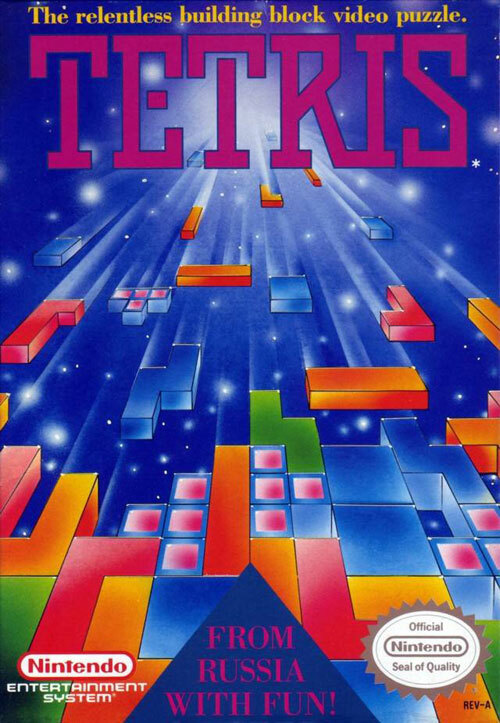 To obtain the highest scores and fastest possible levels, one should create a “Tetris.” A Tetris is the clearing of the four levels at once using the I-shaped Tetrimino, or “I-Tetrimino”. To create a Tetris, the player should leave one of the 10 columns open (preferably the first or last), build up the remaining 9 columns with at least 4 solid rows of Tetriminos, and when the I-Tetrimino comes, drop it into the empty column for a huge “Tetris” bonus. Of course, for the biggest bonus, complete two or more Tetrises in a row, or a “Back-to-Back”! The only way to do this is without having any Single, Double or Triple line clears until your next Tetris. Newer Tetris games have a new feature that allows a T-Tetrimino to first land, then spin it into an empty T-Slot and clear lines. This is known as a “T-Spin”. The T-Spin method uses less blocks than a Tetris would require and the points given are close to what a Tetris gives. To set up a T-Spin, first create a T-Slot. A T-Slot is any Block formation such that when the T-Tetrimino is spun into it, any three of the cells diagonally adjacent to the center of the T-Tetrimino are occupied by existing Blocks. Once the T-Tetrimino is partially in, rotate it so that it fits completely into the T-Slot. To get the most Cascades at once, there is a special method, and this is an advanced trick! Using either (or both) S- or Z-Tetriminos, stack them up horizontally (that is, with the flat part facing down) against the right or left side of the playfield, right on top of each other, until they reach about 4 pieces high (or 8 rows). Use the remaining 7 columns to build an absolute solid layer of rows using the other Tetriminos (including leftover S- and Z-Tetriminos), with no holes. This layer can go as high as you like. Once you have roughly four S- or Z-Tetriminos stacked on top of one another (but could be less or more), and a solid layer of rows beside them, place a vertical I-Tetrimino on the outer highest point of the topmost S- or Z-Tetrimino. If it was an S-Tetrimino, it would be the right side, and if the Z-Tetrimino, it would be the left side. Then when another I-Tetrimino comes into play, place that vertically on the other end of the Z- or S-Tetrimino – or onto its lowest point, thus creating your first “line” – and viola, a 7 row Cascade will occur for a huge bonus! Just like the other Tetris games, this game should be done by making Tetrises. Marathon ends only when the player “Tops Out”. To advance to the higher levels faster, simply do Tetrises that are Back-to-Back and extra points and line clears are given as the bonus! 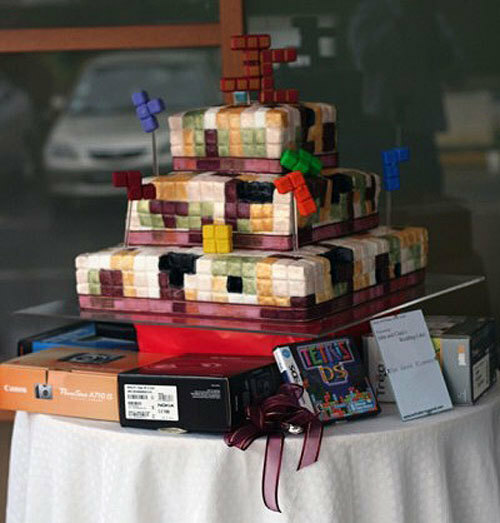 I couldn’t believe it when I saw this wedding cake which is based on the classic building blocks game Tetris. I was wondering that when they started eating the cake that each layer disappeared instantly and you hear a bling noise. It is not the best video game cake which I have seen. I had seen an awesome Super Mario cake where Mario was bursting out of the cake.